Another grape variety widely planted in the central European region, also sometimes called as Pinot Noir of east for it's character reputation. 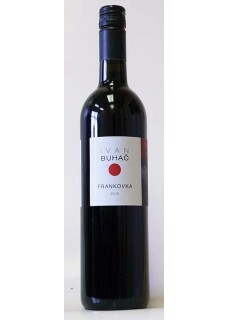 Exact origin is unknown, recent DNA profiling has shown that Frankovka modrá is cross between Gouais blanc and other unidentified grape variety, possibly Blauer Silvaner. This variety is most common red grape variety to be found in all wine producing regions in Slovakia. Variety requires good and dry locations and is late ripening. Lots of sun and sparse rain on the locations Radoš, Lišćak, Božino Brdo, Ciglana, Principovac, Zaravan, Dekan and Široka Šuma were on of the reasons why the Buhač family has 16 acres of white and 4 acres of red varieties, among Frankovka is the newest. Lemberger, Blaufränkisch and Kék Frankos are most frequent synonyms. Food pairing: fish, poultry, particularly duck, veal with gravy, pork, beef, lamb, game-foul, hard cheese and mushrooms.